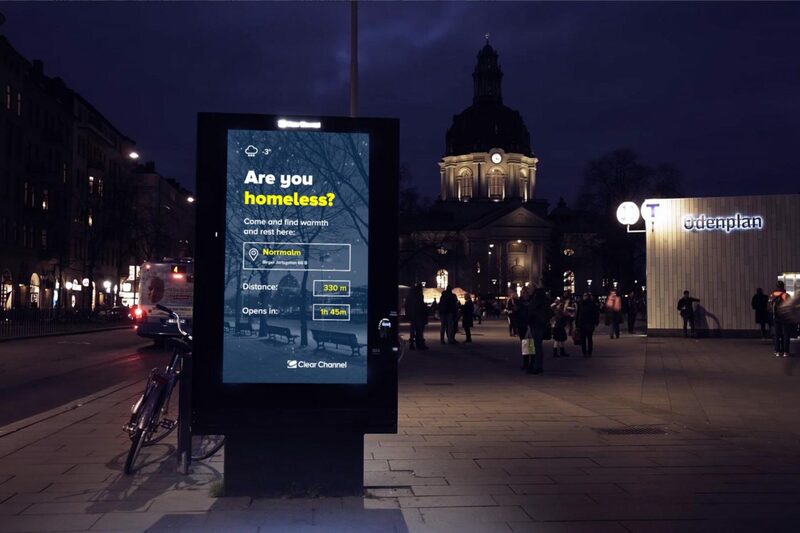 When temperatures drop to -7 degrees Celsius and below in Stockholm, a number of digital billboards throughout the city will exchange flashy ads for directions to the nearest shelter for homeless people. Bye bye consumer marketing, hello community. Winters in Stockholm can be harsh, especially for those without a roof over their heads. On particularly cold nights, when temperatures hit the -7 degrees mark, local government works together with churches, ngo’s and other organizations to provide shelter for the city’s homeless population. Given that these people do not have a permanent place to stay, it can be hard to reach them in time. Last November, however, the Swedish division of advertising firm Clear Channel teamed up with local organizations and decided to make optimal use of their digital billboards’ reach. The selected billboards are located near subway stations and under bridges where homeless people tend to gather. Realizing that these billboards are usually located right where homeless people are likely to gather, 53 strategically selected billboards throughout the city are now used to serve the community. 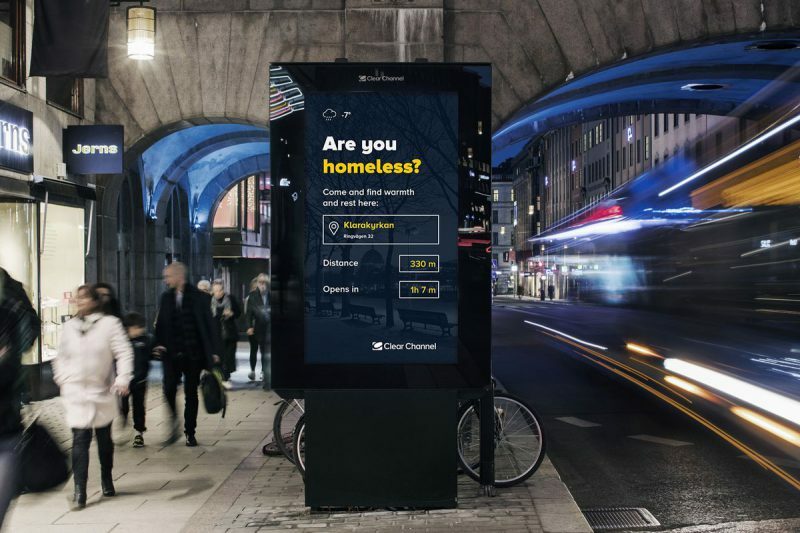 “From what we gathered, most homeless people in Stockholm know where there are shelters, but during these emergencies, they don’t know where the new ones will be, and the new ones fill up quickly,” David Klagsbrun, head of communications at Clear Channel, told Co.Design. On cold nights, one of the ad slots in the regular ad loop on these screens is automatically replaced by two messages: one showing directions and information about the nearest (available) shelter, and another displaying information for volunteers – including items most needed for donation, from coats and sweaters to toothbrushes. These public service announcements are displayed for free. Clear Channel doesn’t receive any revenue from them. Although a formal evaluation will be carried out this month (after a three-month pilot), the initiative seems to be a success – both in terms of directing homeless people to shelters and in mobilizing people to respond to the needs of their fellow Stockholmers. Since starting the project, Clear Channel has received feedback from the shelters stating the arrival of many fresh faces but also an increased amount of donated items, compared with previous years. These positive effects could mean that this smart city technology will be replicated not only in other Swedish cities, but also in other countries – and thus be of great support to the European homeless community. Artist Jennifer Bolande replaces billboard advertisements along the highway in Coachella Valley with photos of the landscape behind them. The Toronto office of advertising agency BBDO came up with this rather brilliant and funny intervention on behalf of Smart. The ad men strategically placed numerous tiny billboards along sidewalks, on walls and public objects in Toronto.